with the van best recommended for you. Our upfitting solutions are provided by only the best, most trusted vendors in the business. With an upfitted van, the possibilities are endless. From an HVAC super van to a custom bike trip shuttle, see how you can become inspired for your own upfitting. Organization is the heart of efficiency. HVAC contractors and plumbers carry a large amount of parts along with all the other equipment they need to get the job done right. So when you carry all those parts, you need a van that’s not only large enough, but also organized. With a partition and upfit package that allows you to organize your equipment better, you can be safer and more efficient so you’ll be on your way to the next job in no time. An electrician’s van is their office, and as such, comfort and safety are top of mind. As a profession that requires a high level of mobility, you carry a lot of equipment – so a strong, protective barrier between you and the cargo area is a must. One of your most valuable tools is your ladder, so to maximize your storage and transport abilities, a ladder rack as part of your upfit package is an invaluable addition. 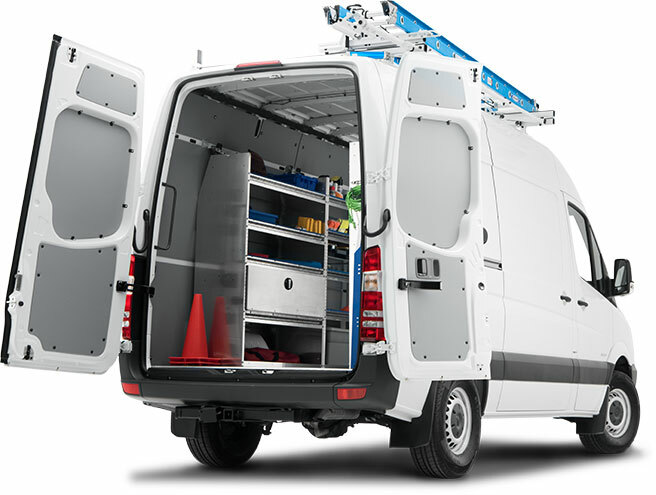 For electricians and telecom workers, the Sprinter van is a perfect fit. How can an upfit benefit your business? Mercedes-Benz vans are the ultimate foundation for any upfit. Whatever the nature of your business, be it people moving, painting, delivery and more, our vans offer superior capabilities designed with your future solution in mind. Need more storage? Better organization? Perhaps you need to be able to transport a large amount of people or freight. If so, an upfit solution just might be what you need. Want to see MasterSolutions upfits in action? Click to get complete 360° interior views of our upfitted vans. Mercedes-Benz allows qualified upfitters to become part of the MasterUpfitter network. These experts in their respective fields work to the highest standards and UpfittingGuidelines, giving you the confidence during your next purchase. Check back soon for a full roster of MasterUpfitters ready to help you grow your business. For more information, contact your authorized Mercedes-Benz dealer. 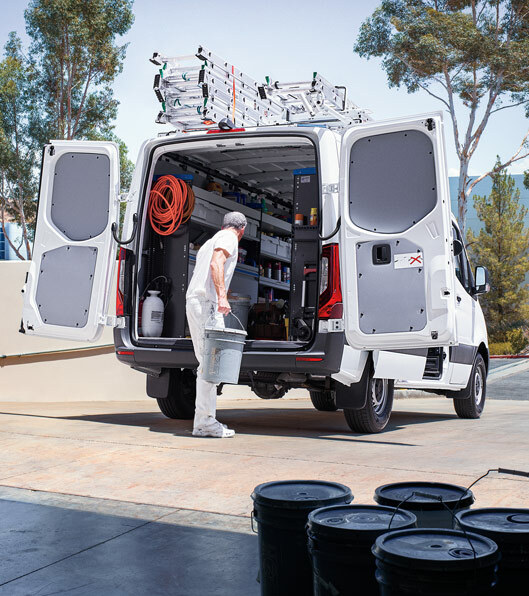 The Daimler Vans Upfitter Portal includes technical information and resources necessary to upfit a Sprinter or Metris Van, including: specific model resource charts, 2D drawings, upfitter equipment bulletins, photos and body builder handbooks.